This API uses the PCAN©-Basic 4.0 API from PEAK-System Germany to establish one or more CAN networks. 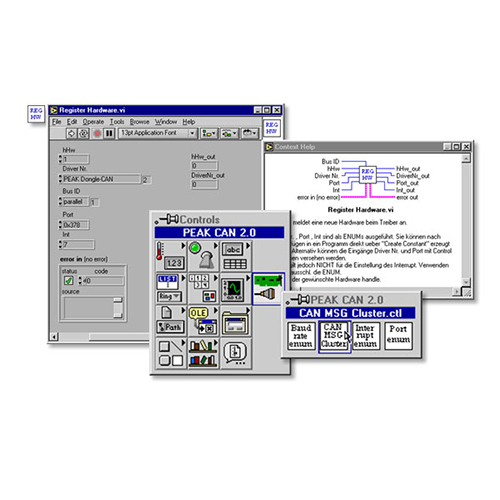 Using the LabVIEW® API, you can exchange CAN messages via CAN 1.0/2.0B and CAN FD with the PCAN© hardware. CAN FD is supported by the PEAK device driver startin with version 4 and the PCAN©-Basic API also from version 4.0. The LabVIEW® API is strongly related to the PCAN©-Basic 4.0 help files and supports LabVIEW® 2014 or any higher version. Please keep in mind that you have to download the PCAN© Basic FD driver from PEAK-System Germany or PEAK-System distrubutors first.